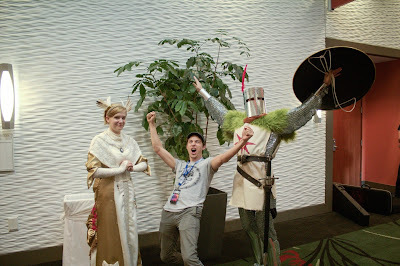 The Careless Gamer Blog: Travel Journal: Escapist Expo, Episode IV (II in the US): A New Adventure! Travel Journal: Escapist Expo, Episode IV (II in the US): A New Adventure! 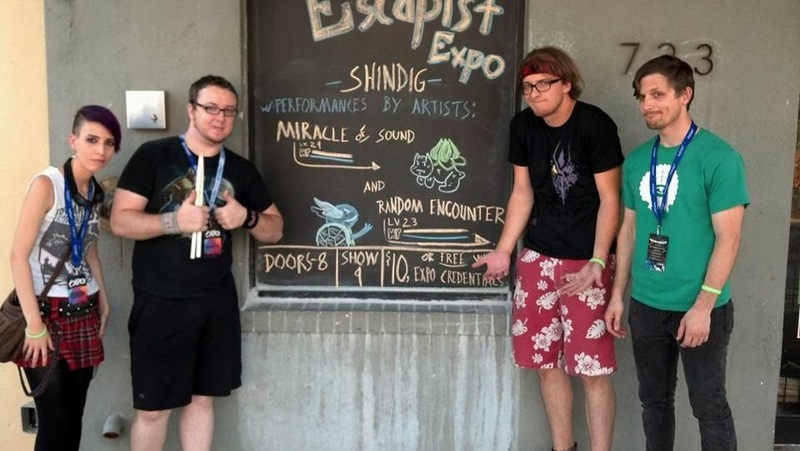 I can hardly believe that it's been a whole year since we departed on an epic adventure to the Escapist Expo last year but somehow time has flown by and the second Escapist Expo has come and gone. A super-flat, completely dead tire with a damaged hub cap. A second tire that's been gradually dying over the last 18 months. A new hornet's nest on the gas-cap. A battery that barely works despite not being connected to anything. The return of the mysterious "flapping sound" (and accompanying smell) every time I turn the air conditioning on. After a few panicked phone calls I got the van towed to Tire Kingdom, thanks to my "fraternity" membership in the mysterious AAA. It was at this time that Mike (pictured above) told me this was the first van in our class he'd towed that hadn't flipped. 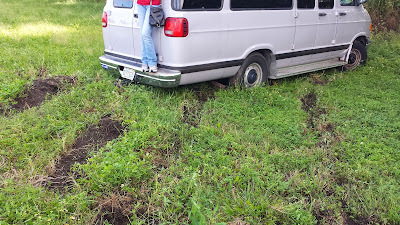 He suggested we get wider tires because our top-heavy van is some kind of a deathtrap waiting to happen if we ever deviated from the main road or got hit with a strong gust of wind. 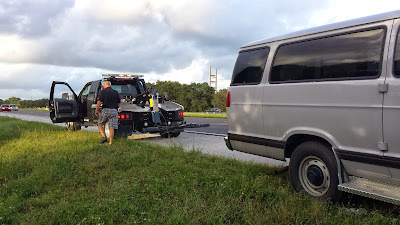 Valuing our lives we reluctantly agreed because while we can probably survive flipping a car, we probably can't survive flipping a tour van filled with all our gear. 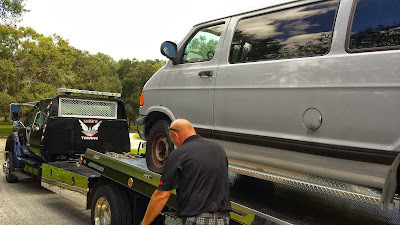 4 new tires, 1 new battery, 1 radiator, a tightened emergency tire (which almost fell off while it was going on the tow truck), 2 or 4 new "bearings" or "struts" or "shocks" (some sort of technical jargon I don't understand but in short it will make not make us bottom out every time we hit a bump), a set of new wipers (Ours kind of melt to the windshield when we use them), the elimination of that weird "flapping" sound in the AC duct (He never told me what was making the noise though I suspect the swamp-frog mafia had a hand in it) later we had a fully working van and fully negative bank account. I departed from Sarasota at around 2:05pm towards Tampa to meet with the rest of the band. The plan was to meet up at 5pm, pack, waiting for Konami to arrive from his top-secret job and depart before 7:30, but it didn't quite happen that way. As I listened to the accursed Puzzle Theme solo MIDI on loop, at half speed, for the entire drive to Orlando I got a phone call about 20 minutes away from Moose's. He asked if I'd be at his place soon and I told him I was still perfectly on schedule for 5pm, as I'd hit traffic, and he said he was going to leave his house for a moment to pick up dinner. He didn't return home, leaving me locked outside until about 6:02PM but by then the mosquitoes had already done their damage. Completely starving (I skipped lunch and they didn't bring me any dinner) we got side-tracked in conversations until about 7PM, learned that Konami had encountered the same traffic i'd hit, and went food shopping at Publix, careful to avoid the chicken. 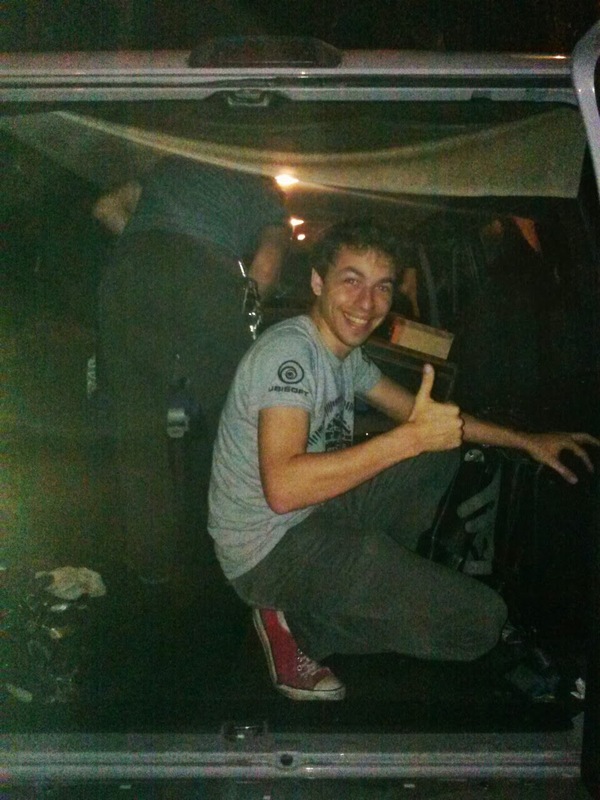 The tour van was packed with band gear, stick puppets, 3 types of sandwich meat, 1 jar of really bad-tasting peanut butter, bread, watermelon, chips, salsa, donuts, and other food by the time Kit arrived, unexpectedly late, at almost 9:45pm. In our haste we forgot the bring a cooler and the half-life of our food was suddenly in question as we drove up. I slept during the entire ride up and didn't wake until we arrived in Durham the next morning. A pleasantly uneventful journey from my perspective. ~9:00am. As the band unloaded gear, I took my accordion, merch tote, food, and set up our booth in the Jr. Ballroom. Our booth was located next to the friendly local division of the Art Institute (which I attended in Pittsburgh some years back), and a talented wand maker & Quiddich player (not affiliated with the Art Institute of Hogwarts). The convention had grown significantly since last year and I felt like there was a lot more space for vendors and attendees alike to maneuver. Almost immediately I bumped into friends from last year, fans of the band, and people who have blurred the line between the two. 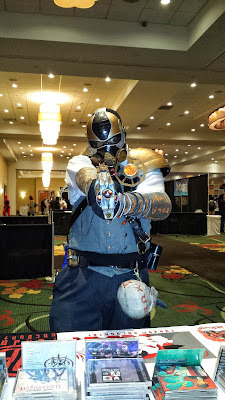 I had a blast meeting people dressed as pirates, Protomen, 'Link's of various genders, steampunk people, zombies, zombie hunters, families of super-heroes, and League of Legends characters as they stopped by the booth to chat. For the second year in a row I was floored with how friendly everyone was, and how genuine the conversations I had with people were. I was really enjoying meeting each new person that passed by, chatting about they journeys at the Expo thus far, how they share a love for Wind Waker, or hearing tales of their drunken misadventures at a party that took place the night before... and then it hit me... though the Escapist Expo might be the largest convention, they've grown the most positive con/fest/expo community I've ever been privileged to be a part of. I type this with utter sincerity. If you get a chance to experience it, I highly recommend going because it seems that the first year wasn't just a fluke of me meeting a reclusive bunch of positive people. I met bakers, bikers, artists, musicians, retail workers, call center veterans, and students, all of which had something engaging to talk about once we really got chatting. At some point between selling CD's, and telling everyone who came by our table to check out the Saturday Night Shindig (the event we were playing) I got to look around the vendor room, briefly chat with the BoomSlank tee shirt trio, that Josh guy from J.G. 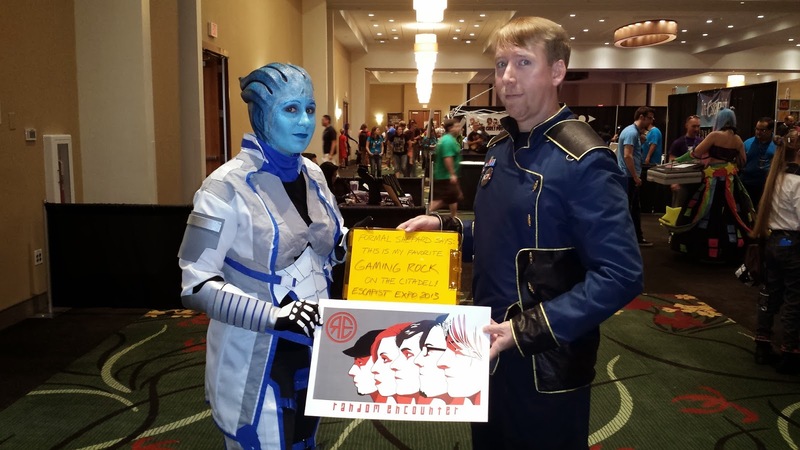 Reviews, the incredibly friendly D20 Burlesque girls (who sold me a beautiful notebook), and some really awesome indie game-designers I'd met at MAGFest the year prior. I also got to chat with a cool retro-game vendor I'd bought a copy of 'Dark Sun' from the year prior. One watermelon, one package of meat, one whiff of bad peanut butter, and a full batch of bandannas later in was 6pm, and the vendor room was closed. Konami and Kit picked me up, after checking out a friend's cool looking Imperial Guard themed motorcycle, and we drove to the hotel. Situated a few miles down the road, it was one of the nicer hotels I've stayed in that didn't have free internet or a way of acquiring that didn't involve being a bad guest. I mention this because I had a work-related project due that night and without internet I was forced to take my laptop with me to the evening's festivities, a small rock show featuring Metroid Metal, Danimal Cannon, Eight Bit Disaster, D&D Slugger(s? ), Big Brigade, and the friendly ladies from D20 Burlesque. While I didn't stick around for the Burlesque show (not my thing), I had a most fantastic evening as I worked (borrowing internet from a nearby cafe/home) to the live sounds of some of my favorite bands. Somewhere in the mix I caught a few pickup games of Smash Bros. Melee against a friendly gentleman with a "Returners" tee shirt, played about 6 minutes of Metroid while Metroid Metal owned house (a remarkable experience), and watched as Bit Brigade beat Megaman 2 while rocking the soundtrack, throwing in some Kid Ikarus and MM3 in the mix where the soundtrack got redundant. I didn't think their live show could possibly get better, but somehow they do each time I see them. We said goodnight to our friends, turned in early (10pm?! ), and tried to sleep as someone in the next room over smoked their lungs out. After a late start, Konami and I got lost on our way to the convention center and arrived at the booth a little more late than was fashionable. 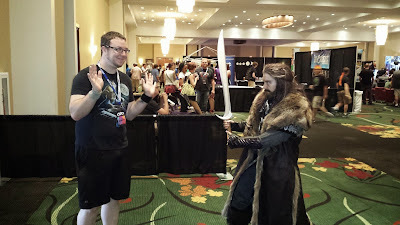 Our second day of meeting people/vending began at around 9:20AM and I chatted with Dwarves from The Hobbit (a masterful twist, the one pictured above was actually a woman! ), Formal Commander Shepard & Liara, some awesome Dark Souls cosplayers [Konami needs to give me that picture], a birthday-baker who gave everyone awesome cookies, my wife from Skyrim (I got really drunk in that game and woke up to discover that I'd gotten married), a random expo-goer who also has face blindness (she told me that she always wears a specific accessory so people like us can always recognize her. I found it very helpful and explained that's why I always wear the same hat), and an Imperial 40K Commissar. One of the Insomniac game guys, a creative director(! ), even stopped by to chat about the new Ratchet and Clank game! I got to walk around the Jr. Ballroom a little bit more than the previous day, meet more of the vendors, and was pleasantly surprised when Greg from the Escapist Staff randomly gave me a small platter of meat mid-day, after my rations had all gone bad or been consumed by Moose the night before in a fit of drunken Moose-hunger. 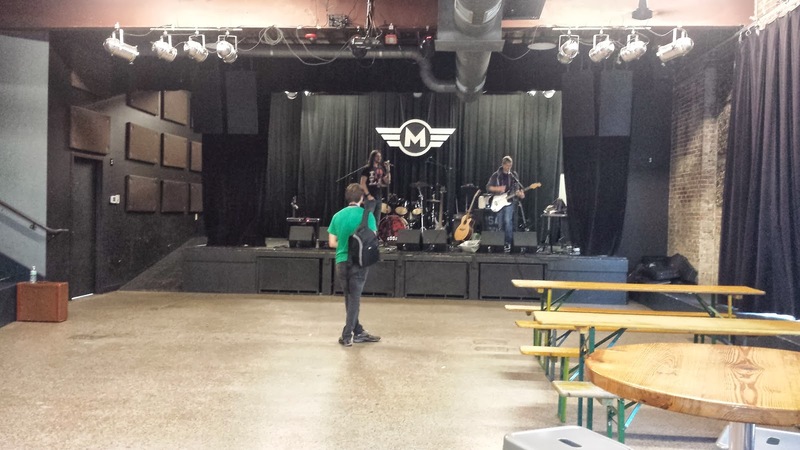 I continued vending while the rest of the band set up for the show, and it wasn't until around 6pm that Konami showed up to help me pack the merch tote, accordion, and we took the 15 minute walk to the Motorco. The walk would have been infinitely faster without the heavy merch tote, or the foot traffic generated by a mini October-fest and a wedding, but it was pretty enjoyable otherwise. 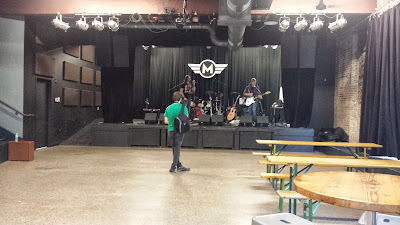 We arrived at the Motorco, a real rock venue, at about the time Miracle of Sound was doing their sound check. It was a sort of magical experience getting to watch Gavin and his friend rock out to an empty room, just us, experiment a little, tweak levels, and see the man with the remarkable vocal range actually singing, generating the low, deep vocals I was hearing. It was like a mini-show just for us! We did our sound check shortly after, chatted with elements of the Escapist Staff, and I asked for permission ahead of time to stand on the bar because it seemed like a respectful thing to do. It's worth noting that the writing on the wall of the men's restroom at the Motorco includes the deathly hollows, which I thought was kind of cool. We also quickly became good acquaintances with much of the Motorco staff, who turned out to share similar interests. One of them is even a pretty solid cartoonist who was kind enough to share his work! Konami gave me $5, which I spent $1.00 on to get a drink. As I greedily consumed water, pizza and passed out on the couch, the sun fell, the skies darkened, and a line gradually formed. When they started letting people into the Motorco I had the amazing revelation that almost all of those entering were people I'd personally talked to and who'd said they'd attend. This left a big impact on me... Again, this is normally not the case but people at the Escapist Expo are pretty awesome and if they say they'll see you later, they mean it (more often than not)! 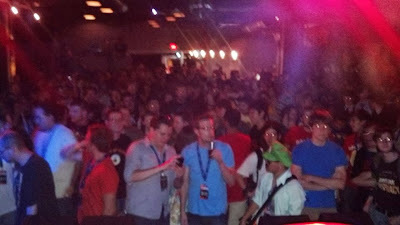 The venue started turning people away (we hit venue capacity) at around 8:25PM and the show started on time. 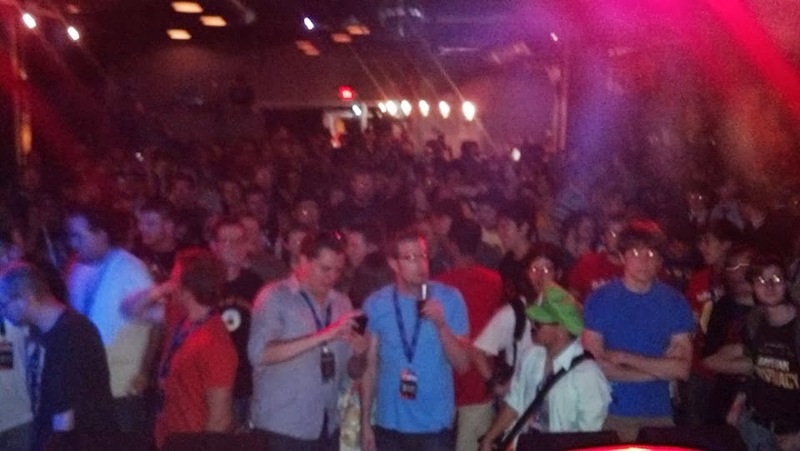 The Warp Zone delivered a really catchy song about the One Ring to Rule Them All, and the crowd was really into it. Then Kit started talking to people on stage for awhile, while Konami and Rook tried to figure out what was wrong with her Bass guitar. Something to do with the internal pickup batteries being really cheap... We still started on time but I'm starting to believe that her bass really is haunted. As for our show, it was an absolute blast. People seemed to notice my quirky antics more than usual, people understood some of our inside jokes, and people sang along to some of our songs. I was comfortable enough to attempt Ocean King (albeit with my eyes closed for most of it), made a giant conga line (which got huge really quickly), and experienced one of my favorite shows we've ever played... ever. One interesting highlight was when I was standing on the bar (mentioned earlier) covered in dozens of glass bottles at my feet and was shoved off by someone. I caught my balance, so I didn't fall off, shrugged off the attempted shoving, and carried on like nothing happened, trying my best to not move my feet into the glass bottles I was strategically avoiding. A moment later I was shoved even harder from behind, and plummeted accordion first towards the ground. Luckily some guy was able to keep me from falling on my face, but at the cost of his mug of PBR, which shattered. Mid song, without skipping a beat I pulled out the rest of the money Konami had given me, handed it to the guy, gave him a mini-hug, and ran back on stage. Serious kudos to the PBR guy for helping the evening stay fun and not ending early. Shortly after our set Gavin and his friend, the vastly enjoyable duo, Miracle of Sound, rocked house. Though he played the song the previous year, when he played a ballad about my favorite character in Game of Thrones (which I've finally got around to seeing since last Expo) I finally understood what he was talking about and it instantly became one of my favorite songs from last year's "really good song I have no idea what it's about" status. After the show we got to chat with the other acts, with fans, with Motorco staff, and Escapist staff about everything from Mars the Greek god of war fleeing and hiding in one instance, to various real-world cooking techniques prevalent in the the Elder Scrolls series. Friends were made, drinks were consumed, and we were thankful that the venue was open until 2am... because we didn't get home until much much later... After getting very lost in the fog. Moose drew the short straw and drove me to the convention center. We only got a little bit lost and arrived shortly before 9AM. 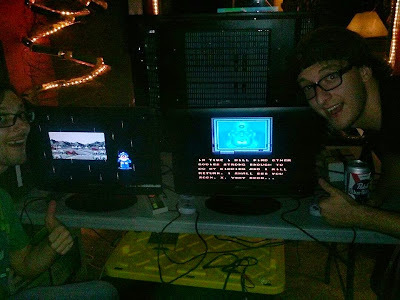 Sustained by potato chips and dozens of cups of water, it was another fun day of meeting people, chatting, and vending... Only with a slightly hung over feel about it. We stayed at the convention a bit later than intended, so I made use of the time to check out the main ball room, bumped into Yahtzee and give him our new album (it was a less awkward interaction than the previous year on my end and he even smiled as he said "Thanks, man. Cheers! "), met Cynthia Sheppard (a friendly and talented artist showcasing lots of MTG work, who I hope to see at Spectrum Live next year), got a 10 minute back massage with the awesome professionals who i'd been chatting with all weekend, and said my goodbyes. We departed at around 4:05PM, chatted until we hit SC, and complained bitterly as every gas station we tried to stop at was closed BEFORE 8PM! Since the nature of our stop was food/restroom related we found a rest stop that had a vending machine straight out of the 80's... complete with melted Hershey's, Whatchamacallits, Vienna sausage, and (I'm told but couldn't confirm) a single can of Surge. A few hours later we stopped at a gas station in Georgia that had over a dozen black cats in sight at any given moment. I slept the rest of the way and didn't wake up until we were at Moose's in Orlando. 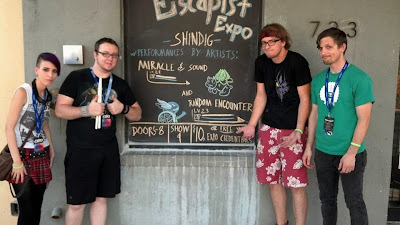 The Escapist Expo II: Fun times and friendly people! I already can't wait till next year, though I'm overdue for some sleep.